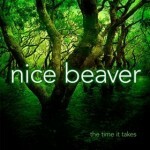 Share the post "Album review: NICE BEAVER – The Time It Takes"
Nice Beaver – presumably named from the classic Frank Drebbin line in ‘The Naked Gun’ – are a Dutch four-piece delivering a brand of sparkling progressive rock that many of today’s so-called ‘prog’ bands would do well to listen to – and learn. ‘The Time It Takes’ is the band’s third studio album following on from ‘On Dry Land’ (2002) and 2004’s ‘Oregon’ – both of which were excellent, both of which were criminally ignored (as usual) by a rock press far too eager to hype up the next big thing. So following a ten year hiatus when, according to keyboardist and singer Erik Groeneweg, “life happened”, the band reassembled in the studio in 2014 with eight new songs and ten years more life experience to deliver this exceptional piece of work. Drawing on a host of influences – Camel, Genesis, Kansas, Marillion – yet managing to sound completely of their time, ‘The Time It Takes’ sees Nice Beaver (stop sniggering will you) distill their hopes and fears of everyday life and the world in general into a progressive rock masterpiece. The album definitely has a harder edge than their previous albums, due in no small part to the production of Stephen van Haestregt – former drummer with Within Temptation – who appears to have encouraged the band to take a few risks which, at the end of the day, is what progressive rock is all about. Where Nice Beaver deviate most notably from their influences is in their use of jazz inflections – on the excellent ‘The Path To My House’ and, particularly, ‘Sound Behind Sound’ with its delicate arpeggios segueing into a delicious walking bass-line and bringing to mind, to these ears anyway, a Stranglers ‘Golden Brown’ vibe. Throughout the album there is never a dull moment and, indeed, some quite exceptional passages that both thrill and inspire – the marimba-driven ‘Timeline’, the staccato guitar figure and anthemic chorus of opener ‘River So Wide’ and the Marillion-esque ‘Rainbow’s End’ with its charming, pastoral vibe breaking into power riffing and a very Rothery-like solo. Despite all this brilliance, the best is saved for last with the eleven minute closer ‘Waiting For The Bell To Toll’ with its excellent libretto, soaring keys and the best wah-wah guitar you’ve heard since Uriah Heep’s ‘Gypsy’ all those years ago. The whole album is shot-through with both first-rate songwriting and stunning musicianship from beginning to end. The bass of Peter Stel is particularly fine and the guitar work of Hans Gerritse, with its ever-changing styles and soaring solos, is an absolute joy. This entry was posted in ALBUM REVIEWS, ALBUM REVIEWS (Mobile), All Posts and tagged Netherlands, Nice Beaver, prog, Progressive Rock, review, The Time It Takes. Bookmark the permalink. thank you very much for this nice review. Not just positive, but insightful. Much appreciated!